Police check evidence that was taken from the store. The fate of Fulton’s 420 Emporium head shop was sealed four weeks ago today. A search warrant application (see the link at bottom to read the entire application) filed by federal authorities as part of the nationwide crackdown on synthetic drug sales called Operation Log Jam details a visit to the Broadway shop by an undercover investigator. The investigator talked with a store clerk and bought some synthetic drugs, according to the application. Four weeks later, federal, state and Fulton police swooped down on the store. They appeared to seize products and held at least one person in handcuffs for a time. Specific information about the raid in Fulton and about the scores of raids carried out from coast to coast was not available. The United States Attorney in Syracuse declined to comment Wednesday except to acknowledge that search warrants were carried out in cooperation with the federal Drug Enforcement Administration. The DEA did not comment except to say that a national news conference would be held today in Washington, DC. 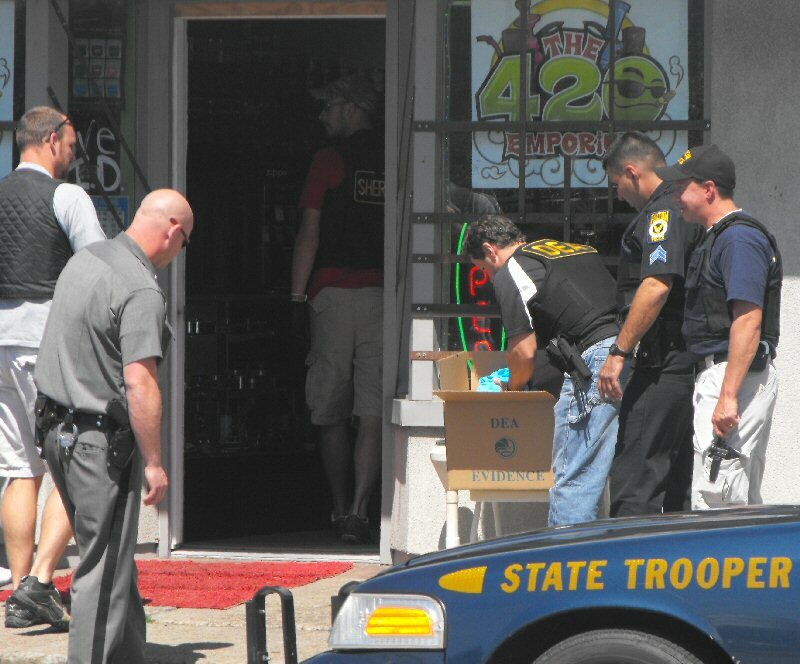 Other news outlets, including TheBatavian.com in Batavia (which worked together with Oswego County Today on the story), witnessed raids on the other 420 Emporium outlets in Syracuse, Batavia, Brockport and Rochester. The home and warehouse of the chain’s owner was also searched, according to reports. In Central New York, reports indicated that 9 outlets of another head shop chain, called Tebbs Smokehouse, were also raided, along with a home and warehouse of the chain’s owner. And in Western New York, reports indicate that agents raided a large warehouse alleged to be a main distribution point for synthetic drugs for Upstate New York. The coordinated operation was the first since President Obama signed into law earlier this month a bill banning certain substances commonly found in the synthetic drugs called synthetic marijuana and bath salts. The search warrant application notes that there had been many complaints and concerns about the 420 Emporium since it opened in the late fall of 2011. The Fulton store was the first in the chain of five. Among the issues noted: At 3:30 a.m. on June 28, a police officer noticed activity inside the store. He reported finding a store employee who said he was restocking the shelves, pulling items from a half-filled white garbage bag. The officer then showed proof that he was at least 18 years old to the clerk and made a purchase. The warrant application also solves a small mystery: Who owns the 420 Emporium chain? Reporter Howard Owens at TheBatavian.com had been trying to unravel the mystery, which was solved by Wednesday’s searches. The application notes that business papers filed with the state say the owner is Charles Fitzgerald of Greece, a suburb of Rochester. A woman named Amber Snover claimed to own the business during an appearance before a government body in Batavia., The application notes that she is the live-in girlfriend of Fitzgerald. She also lists herself as owner of a couple of the stores on her Facebook page. Fitzgerald was arrested by Fulton Police last Nov. 2. Someone had smashed out the window of the Fulton store. While investigating the vandalism, police allegedly discovered brass knuckles for sale in the store. They’re illegal to possess or sell. Fitzgerald was charged with 47 felony counts of criminal possession of a weapon. The counts were upgraded to felonies because police said Fitzgerald had been convicted of a crime in the past. The status of the case was not immediately available. He was not arrested yesterday, according to reports, though three of his store clerks in Western New York were taken into custody. As of 6:00 p.m. Wednesday evening, the Fulton store was closed and dark. Thank you to the Fulton City Police and NYS Troopers! !